The O'BRIEN turbo roller geared reel is designed to take the effort and time out of moving a portable fence line. The geared ratio of 3:1 means that for every turn of the handle the drum has rotated three times. 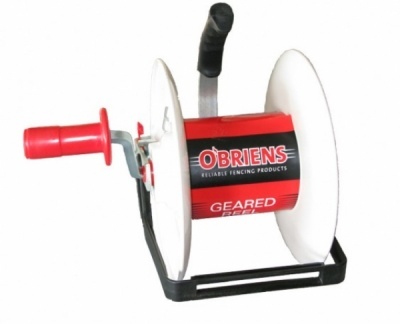 The roller has a drum lock , and a line guide to stop twine or wire skipping over the side and jamming the roller. Please note this reel is made in New Zealand and is very high quality. It has a metal frame and the gearing is internal is reduce the chance of dirt or grit getting in the cogs. The mount on this reel will fit Gallagher system reel posts.